You know what QR Codes are and how they’re used in recruitment. 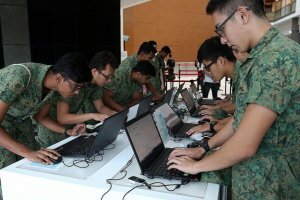 The Enhanced Career and Education Fair (ECEF) held in Singapore allotted each full-time national servicemen (NSFs) a unique QR Code. The QR Code encoded the details of servicemen’s educational qualifications and a list of their skill sets. The aim of the fair was to help the national servicemen secure jobs post the completion of their two year training period. “Because they have been concentrating on national service for the last two years, they may need a little bit more help in order to get updated on the latest employment trends and also to get tips on career development.” – Josephine Teo, Second Manpower Minister. The NSFs had to register one month prior to the event. The registration form included the questions on the candidate’s industry preference, expected salary, educational qualification, and other skills. At the event, the NSFs were given lanyards with unique QR Codes. Potential employers can simply scan the QR Code to learn more about the candidate. Approximate 4000 NSFs from the various national services such as the police, civil services, and the army attended the event. This is one way how Singapore is using QR Codes. Have an opinion on this piece of news? Share your thoughts in the comments section below.